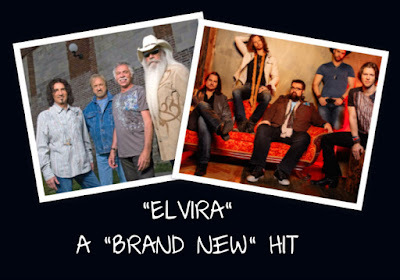 Lovin' Lyrics Music Promotions: THE OAK RIDGE BOYS AND HOME FREE - "ELVIRA: A 'BRAND NEW' HIT"
THE OAK RIDGE BOYS AND HOME FREE - "ELVIRA: A 'BRAND NEW' HIT"
What do you get when you combine one of country's most legendary harmony groups with one of country's newest harmony acapella groups? You get harmonies tighter than a pair of Luke Bryan's skinny jeans from high school. The Oak Ridge Boys have joined voices with the hit acapella group Home Free and have brought their 1981 hit "Elvira" back to life with a new, updated edge and it's making beautiful noise all over social media and various music outlets. How did these two groups decide to come together and recreate one of country music's biggest selling award winning hits? "This all started when I saw "Home Free" on Fox & Friends. I sent them a "Congratulations" great performance note and before the end of the day, I had heard from all five "Home Free Guys". We connected immediately through several conversations. I met for lunch with Tim and we started setting the dates. I also took Tim to the Grand Ole Opry with me and introduced him to Pete Fisher. Pete took their card and booked them on the Opry. Home Free just blew away our Opry audiences, getting 3 standing ovations. We recorded the Oaks and the video with Home Free ins Ricky Skaggs' studio that I built. We are looking for ways to get the 2 groups together for some TV and other dates. We are both booked solid until after Christmas, but, things are happening really fast behind the scenes. From the time Home Free walked into the studio to record "Elvira", the energy level between the groups was "out the top of the roof". A great new group with an unlimited career ahead for them. It was so much fun to do the video. Now, let's do a great big old world tour together!" This had been a great year for both groups and a perfect time for this new song to make an impact. Home Free, the winners of the hit television show "The Sing Off", just made their Grand Ole Opry debut last month, receiving 3 standing ovations and the group has been a viral video sensation for awhile now with their covers of songs like "Your Man" by Josh Turner, "All About That Bass" by Meghan Trainor and "Ring of Fire" by Johnny Cash just to name a few. The new CD will feature a joint venture with country music legend, Charlie Daniels on his hit "The Devil Went Down to Georgia" and several other songs performed only as Home Free can sing them. The Oak Ridge Boys were recently invited to become members of the Country Music Hall of Fame with the induction ceremony taking place in October and are currently playing over 150 nights this year with an additional 20 days on the road, selling out venues across the country and also lending their voices to new recordings by other artists in addition to Home Free including a song on Jimmy Fortune's upcoming CD, "Hits and Hymns". The new version of the song will appear of the upcoming album from Home Free entitled "Country Evolution" which is currently available for pre-order on iTunes and the single is available now for download! I love this version of Elvira it is the perfect fusion of classic old country and new country sounds. I can't wait to hear more from Home Free, their all acapella versions of classic country songs breathe new life into old favorites. Love this awesome collab. from the amazing Home Free & The legendary Oak Ridge Boys!! The Oaks are a class act to let Home Free's incredible a cappella version shine! !